If you watch TV commercials, drive where there's billboards, or ride public transportation where there are posters, you've probably seen pieces from Chevron's Will You Join Us? PR campaign, in which happy and thoughtful looking stock photography models radiate quiet optimism and resolve behind personal energy efficiency affirmations such as "I will use solar power," "I will bike to work," and "I will take the golf clubs out of the trunk." Now, far be it from me to suggest that people should, rather, be leaving their golf clubs inside the trunk all the time. I certainly don't, although I primarily accomplish that by not owning golf clubs. And I don't have a great record when it comes to leaving stuff I do actually own in my car, which I will admit, probably drives down the fuel efficiency of my 1997 Geo Prizm. Nor do I want to pick on the fact that an energy program focused on golf club management is likely to have a limited impact at best. All the suggestions Chevron's offering are more or less decent ideas. But I know I'm not alone in feeling a sense of dissonance about the campaign. Is an energy company ? primarily an oil company ? really lobbying its customers to buy less of what it produces? Are the millions of us among the audience for their campaign really in a stronger position to influence energy policy than Chevron is? 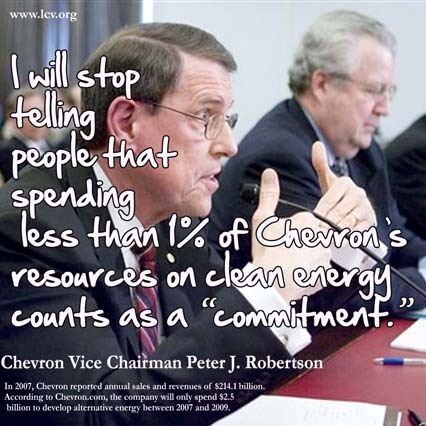 And does Chevron's invitation mean that they've just been waiting for us in order to start getting around to the real change? So it was with more than a little amusement that I stumbled on the League of Conservation's blog post "I Will Point out Hypocrisy." There you can find a few additional affirmations that the leadership at Chevron might consider while most of us are finally making the effort to catch up with their energy conservation and environmental safety initiatives.